You’ve heard me rave about the Ann Arbor Dominicans we have here in our Diocese. We love them and cherish their influence on our children. Before we knew them, though, we were introduced to an equally fine bunch of Dominicans from Nashville. Back in 2000, Scott and I emceed a teen retreat for 700 at our parish, “Destination Jesus.” Parishes from around the diocese attend and the following year, when we emceed again, a group from St. Cecilia Academy joined in the fun. 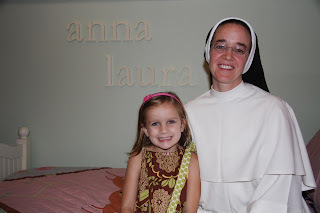 It was there I met Sr. Anna Laura (name ring a bell??) I was eight and a half months pregnant and having the time of my life. To be perfectly honest, I didn’t know they made Sisters that: 1) young, 2) joyful, 3) prayerful and 4) personable. Sr. Anna Laura was from Arkansas, had a twang like me and laughed like nobody’s business. When she shared her vocation story I fell even more in love with her as a person. I guess you could say she and those Sisters taught me how to be a better wife – and soon – a better mom. She returned to DJ, then I took a couple of trips back to Nashville to help put on their first “Teens with Christ” retreat and a day retreat at St. Cecilia. Sr. Anna Laura was moved to a new mission, we moved back to Texas, but the friendship continued. Somehow life always found us. She presented at an Aggie Awakening, we made the trek to Sommerville. We were on our way to Indy and stopped at the Motherhouse to say howdy. The last time we saw each other was July 2004. John Paul was a baby and Will was only 4. A lifetime ago. Our yearly Christmas letters kept us in touch and I was always grateful to receive hers. When God gave us a baby girl, there was never a question what her name would be, Anna-Laura Grace. Then, this Wednesday, my cell phone rings. I didn’t recognize the number, so I sent it to voicemail. When I saw the message pop up, I listened and almost cried. 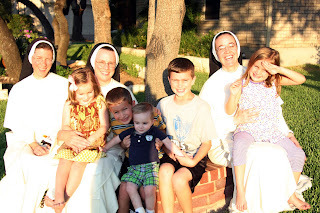 Sr. Anna Laura was on the other end of the line and she and two others Sisters were in Houston, preparing to launch Frassati Catholic High School. Note to my Houstonian friends, if you live in Spring/Woodlands, the school opens Fall 2013. Get your kids enrolled!! I tell ya, that God works in mysterious ways. Our running joke was that somehow we would pray them to Texas, guess it only took ten years 🙂 Now look at the Lonestar State, we have Dominicans everywhere! Saturday morning, a sweet knock, a “Hey Whitaker’s” and a lovely laugh rang through our house. 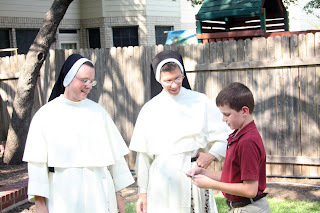 Sr. Anna Laura, Sr. John Paul and Sr. Mary Albert walked through our door. It was a lovely afternoon of visiting, talking about the new high school and praying. John Paul was stoked to have a Sister “named after him” (HA) and Clare kept wondering where her Sister might be. The conversations we shared were awesome and it was great to see an old friend and meet two new ones. Just before they left, we were able to attend the Saturday Vigil Mass. 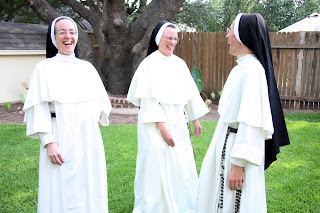 We were given a great gift of the Sisters time on Saturday and it is one I will always cherish. 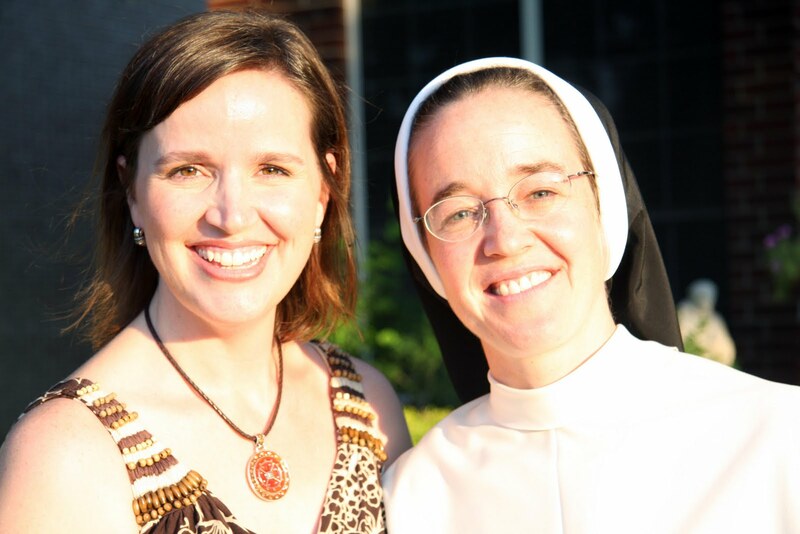 How blessed are we to know two amazing groups of Dominican Sisters. I had to pause for a bit on Saturday. Sr. Anna Laura and I were visting in the kitchen and it struck me. So many people we love have walked through the doors of our home and shared a meal with us. There are such precious memories of family and friends in our home. Everytime I look around our home, I am reminded of those gifts. I truly believe, when you invite someone into your home, you’re inviting them into your life. Our love is equal for both those groups of Sisters and my life has been permanently altered because of their presence. Thanks be to God! I used to joke with Sr. Anna Laura that it was a good thing I met Scott before her, otherwise I might’ve joined them in Nashville. But, Scott is THE reason why I converted to Catholicism and it’s likely I would’ve never give the Sisters a second glance if I’d remained Protestant. Life is as it should be. Is that just total joy or what? Hi! I found your blog to amazing! I’ve wanted to join the Dominican Sisters of St. Cecilia since I was 11 years old! I am now 14 and I’m really hoping to go to Frasatti when it opens! 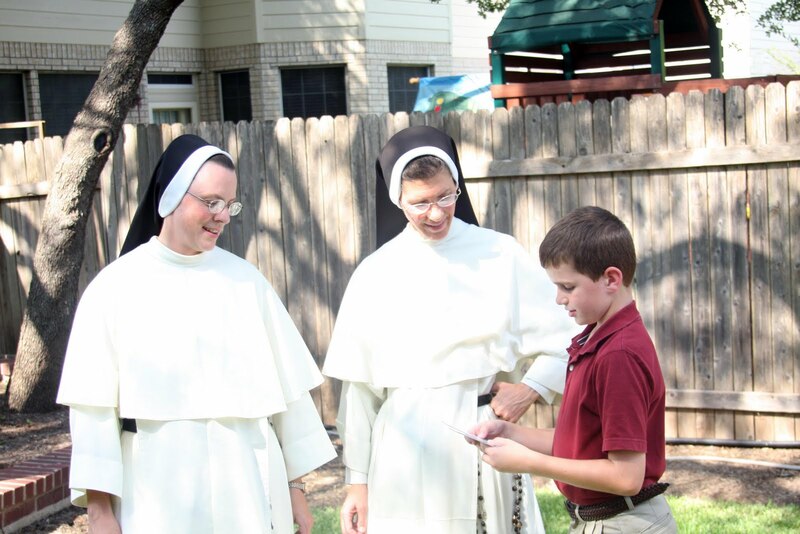 I’ve met briefly with Sr. Mary Albert as I go to the school they’ve been working with to get this high school started! It really is a blessing to have them here, they are amazing women of God! They are an amazing group, indeed. Frassati will be a wonderful high school. As you continue your discernment, you’ll be in my prayers.